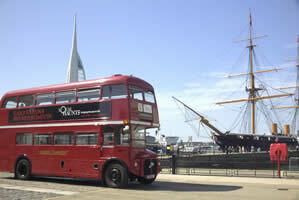 Take a trip back in time and learn about the history, humour and hardships of Portsmouth, the South Coasts premier city, all from the comfort of Alf, our big red vintage London Routemaster bus. Once on board, one of our experienced and fully qualified tourist guides will show you aspects of the city you never knew existed. Hear how Portsmouth grew from a small, fishing village to an important naval town and finally into today's multi-million pound waterside hub of tourism, commerce and industry. What better way to enjoy the sights and stories from days long gone, than from upstairs on Alf. Also, because he's a closed top bus, there are no insects to worry about in summer and wind and rain will present no problem to our intrepid explorers. Thursday and Sunday at 2.00pm. Join us on board Alf, at any of our Local Haunts bus stops. The tour lasts approximately 1½ hours. Tickets are purchased on board Alf and remember, your Local Haunts bus ticket gives you special discounts on some of the City's most popular attractions! * Tours will commence, subject to our Terms and Condition, available online or by request. In any case, there will be no tour, unless there is a minimum of six adult, senior, or, student, fare paying passengers, when we leave The Hard at 1400hrs. Alf is also available for weddings, proms, a day at the races, parties, week-end package tours, shopping trips, Ghost Bus Tours and much more.